Miss Clara Rand of Chicago, a teacher in the city schools, promoted the idea of a library for Newton in the late 1870’s. The “Ben Franklin Library’, a semi-private affair, was established and later the Newton Public Library Association was organized with a membership of $1.00 per year. In 1886, at a special election, the citizens voted to establish and support the Newton Free Library. The site at 2nd and Main was the gift of E.C. Llewellyn and was built by a gift of $15,000.00 from Andrew Carnegie. The City guaranteed at that time the necessary $1,500.00 yearly maintenance. On March 14, 1904, the Newton Free Library held an open house in their new building. It was built to serve a population of 8,000 and today is the oldest public building in town. In 1904, it became a member of the American Library Association. 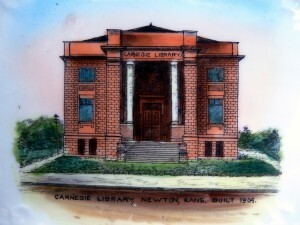 With periodic remodeling, the Carnegie Library served the needs of the community for many years. On April 19, 1966, the City Commission voted to set aside one mill each year to accumulate funds to build a new library. The levy was for 10 years, or until $275,000.00 was accumulated. An additional grant of $53,341.00 in LSCA Title II funds became available. On January 27, 1972, bids were awarded for construction of a new building at the corner of 7th and Oak. The legal name of the library was changed on January 17, 1973, from the Newton Free Library to the Newton Public Library. Transfer from the old Carnegie Library at the corner of 2nd and Main was made to the Newton Public Library in February 1973, and a Ribbon Cutting – Open House was held on April 1, 1973. In 1980, using $185,000 provided by Florence Bessmer, a wing for children called The Florence Bessmer Addition for Children was added. The Florence Bessmer Foundation began providing annual enhancement funds in 1983, primarily for Children’s Services. A locally developed automated circulation system was initiated in 1981 and the automated catalog was added in 1984. In 1986, for the Centennial Anniversary, Alden Allbaugh wrote a comprehensive history of the Library entitled The Newton Public Library 100 Year History 1886 – 1986. The Second Century Endowment Foundation was incorporated to provide funds for enhancement of Adult Services. As the Youth Services Department collections and services continued to expand, the Junior collection was relocated to the lower level in 1988 while the Young People’s collection expanded in the Bessmer Addition. In 1995, the Adult Department public service and office areas were remodeled as the first steps in implementation of the new Dynix library automation system and to provide additional staff work area. The Dynix system became available for public use in June 1997. 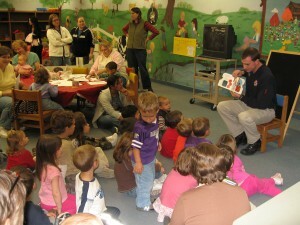 Because of space constraints, the lower level was remodeled to serve as the joint Children’s Services Area in 1998. The ribbon cutting was held on June 11, 1998. The Bessmer Addition was divided to provide a larger meeting room and storage area. 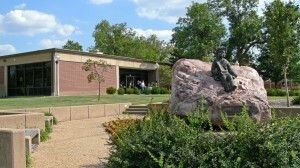 In 1999, the library continued to expand beyond its walls when the library catalog and other databases became accessible through the library website.